CHAPEL HILL, N.C. – When North Carolina consumers shop for health insurance this fall, they’ll notice that premiums are quite a bit higher than last year. That’s because BCBSNC’s ACA customers continue to use a great deal of expensive health care – and that drives rates higher. 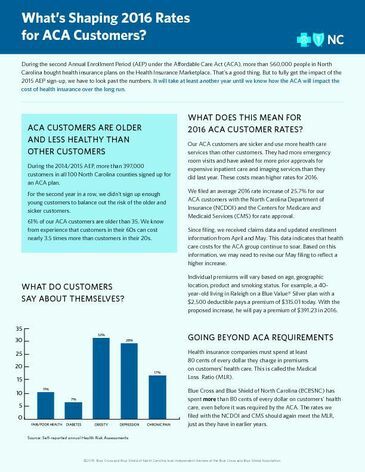 Blue Cross and Blue Shield of North Carolina proposes an average rate increase for individual ACA plans of 25.7 percent beginning January 1, 2016. BCBSNC filed on and off Exchange1 rates for individual under 65 plans under the Affordable Care Act with North Carolina Department of Insurance (NCDOI) and Centers for Medicare and Medicaid Services (CMS) on May 15. Since filing, BCBSNC has received claims data and updated enrollment information from April and May, indicating that health care costs for the ACA group continue to soar. Based on this information, the company may need to revise this filing to reflect a higher increase. During the Affordable Care Act’s (ACA) second annual enrollment period, 397,000 customers chose BCBSNC plans. These customers are about the same age as those who enrolled in 2014. However, more of them self-report that they have chronic health conditions, which typically result in higher use of health care services. “We continue learning about our ACA customers and how they use their health insurance. In setting these rates, we had a full year of health care usage and cost data to work with.” said Patrick Getzen, vice president and chief actuary for BCBSNC. BCBSNC, and all insurers, set premiums based on the use of health services by those covered by the plan. A successful insurance pool needs a mix of younger, healthier customers to offset the costs of older customers or those with chronic conditions. The ACA’s minimum Medical Loss Ratio (MLR) requirement protects consumers from excessive rate increases and uncertainties in the rate-setting process. Customers receive a rebate if their health insurer has overpriced plans or does not pay enough in health care claims. BCBSNC consistently spends more than the required amount on customers’ health care and has since before the requirement became effective in 2011. Since 2011, BCBSNC has spent $760 million more than required on health care. The Exchange, or the Health Insurance Marketplace, is an independent entity run by the federal government.